Are you ready to engage in a cause and join a movement? Do you value independence, innovation and equality? LightHouse’s Compass Club is a group of donors just like you who are dedicated to supporting our ever-growing blindness community. The Compass Club is LightHouse’s monthly giving program. It’s convenient, fits any budget and maximizes the impact of your donation. Our generous Compass Club members provide LightHouse with steady, reliable support to help us continue to deliver opportunities, community and education whenever and wherever the need is greatest. Recurring monthly donations are an excellent way to enrich the lives of countless individuals who are blind or low vision. All Compass Club members receive an ongoing 10% discount at the Adaptations Store and other special perks. Just click the link below and be sure to select ‘Compass Club’ from the dropdown menu, then ‘Monthly’ after you determine your donation amount. Since 1902, LightHouse donors have stood united by their commitment to a common mission: to promote the independence, equality and self-reliance of people who are blind or low vision and amplify the voices of blind individuals around the world. 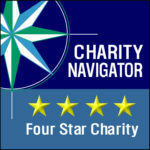 LightHouse For the Blind and Visually Impaired has been awarded a four-star rating from Charity Navigator, the premier charity evaluator— ranking us among the top U.S. charities for financial health, accountability and transparency.